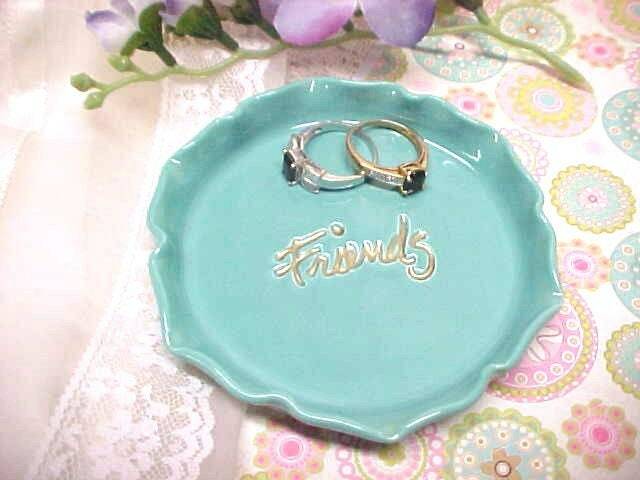 This is a beautiful Turquoise Pottery Trinket Dish stamped with the word FRIENDS in gorgeous Gold color letters. I also handcrafted lovely delicate fluted edges. Perfect & thoughtful gift for a Friend! Amaze them with your sense of style! 🎀 NOTICE: Since it has the Gold letters, I would not use this for food, only for decorative purposes, such as a ring dish or jewelry tray. This wheel thrown, very shallow bowl is about 4 inches wide & 5/8 inch deep. Protective Cork pads on bottom. Ready to Mail when you purchase! And If you like, I can also add a short message to your friend in the package. Just type in the Note to Seller on the Checkout page.